Although Belfast is less than half the size of Dublin, two thirds of the people of Northern Ireland live there. After suffering political violence during the Troubles, Belfast is now a peaceful city that is quickly growing and developing. With so many things to do in Belfast and the surrounding areas, now is a great time to bump Northern Ireland up on your travel list. Northern Ireland is also known more recently for its Game of Thrones filming locations. Game of Thrones actually employs more people in Belfast than the government does. The studios where they film is right next to the Titanic Belfast Museum and is also where they stored the original iron throne. They still store some of the show’s costumes there, but the building unfortunately is not open to the public. From restaurants to tours to museums and more, these top things to do in Belfast will lead the way for your journey through Northern Ireland. The world’s largest Titanic visitor’s experience, the Titanic Belfast Museum takes you back in time to tell the Titanic’s story from construction all the way through its devastating shipwreck and the aftermath, including accounts of the underwater discoveries of the wreck. The story is told with depth and detail using interactive exhibits using special effects and an actual ride, as well as full-scale reconstructions. Hearing firsthand accounts of what happened from survivors is incredibly sad, but it really takes you back to those moments and gives you some semblance of understanding of what the people on the ship were feeling. The museum is located on the site of the former Harland & Wolff shipyard where the RMS Titanic was built. This area of Belfast is known as the Titanic Quarter. The Titanic Belfast Museum is the perfect rainy day activity. I recommend allowing at least 2-3 hours to explore all there is to see and learn in the museum. The iconic Belfast City Hall building is impressive in itself, which was completed in 1906 and is surrounded by the Titanic Memorial Gardens honoring the victims from the ship’s sinking. On special occasions, floodlights illuminate the entire exterior or the building with a particular color or combination of colors. 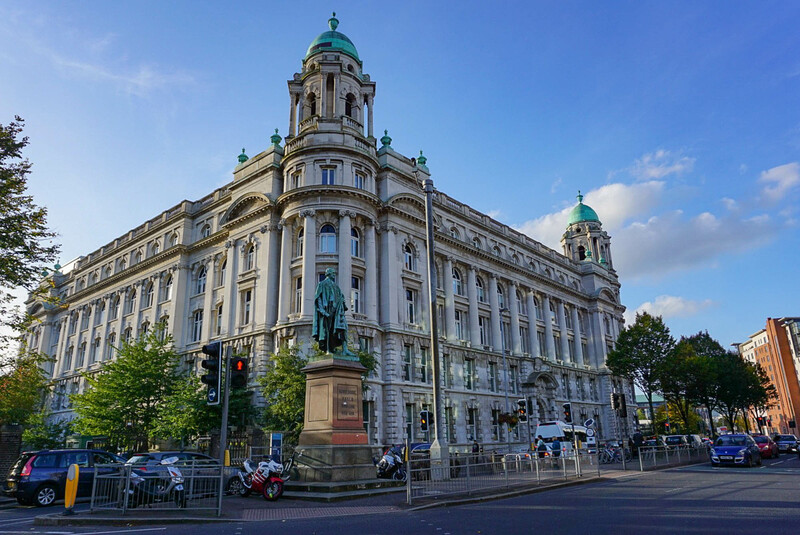 They offer free guided tours daily to learn about the history of Belfast City Hall and there is also a visitor’s exhibition that takes you along on the journey from the city’s past to present. Dinner at Fratelli was easily my favorite meal in the city, though I may be biased since I am a sucker for any kind of Italian food. We started off with the mini caprese and tiger prawn, rock shrimp, chili and garlic oil appetizers. For the main course, we enjoyed every last bite of the porcini mushroom ravioli and the bolognese rigatoni. We topped it all off with a bottle of Pino Nero. We concluded with two of their mini-desserts — cioccolato moose e biscotti crocanti al cioccolato and cheesecake al cioccolate bianco e pistacchio. This hipster hotspot prioritizes high quality, locally sourced food and overall sustainable practices. Made in Belfast works with producers who they know really look after their animals. They have a killer baked brie and focaccia bread combo with a balsamic dipping sauce and olive tapenade that my mouth is watering just thinking about. It can get crowded for dinner, so we went for lunch instead and had no problem getting a table. Keep in mind this may limit your food options as they may not have as much availability from their menu during the day. While I didn’t take part on a walking tour, it’s something I wish I would have done after learning more from our tour guide when visiting Giant’s Causeway. The political conflict 3-hour walking tour will give you two different perspectives on the Troubles to help understand from both the Republican and Loyalist viewpoints. You’ll learn about the history of the Troubles and the significant impact they had on the city and people of Belfast. Technically this is outside of Belfast, but it’s still a worthwhile day trip! If you’re not renting a car in Northern Ireland, the best way to see Giant’s Causeway is on a guided tour. I even prefer the tour in this case, because we got a lot of background information along the journey that I wouldn’t have known otherwise. For the perfect Giant’s Causeway day trip I booked the Giant’s Causeway Full Day Tour from Belfast and had a fantastic experience. Read up on my Giant’s Causeway Day Trip for all the details! When you visit Belfast, the Holiday Inn Belfast City Centre is a great place to stay close to the city center. You’ll find plenty to do within walking distance from the hotel, and have a welcoming place to return to at the end of the day. There’s a bar and restaurant downstairs alongside cozy fireplaces when you need to warm up after a chilly day on the town. Do you have suggestions for the best things to do in Belfast? Share them in the comments below! Marissa, this is such a lovely blog and post, complimented with nice photos. Belfast city Hall,Giant’s Causeway and Titanic museum are the must while in Northern Ireland. Titanic Museum will is the biggest museum of it’s kind. It will take you back in Titanic times and will leave memories forever. Who hasn’t watched this movie. We probably more or less all did. Giant’s Causeway-is a perfect day out for all the family.A unique place in Ireland. If you’re looking for tips on things to do in Dublin, then visit https://dublinkids.ie we wish everyone happy happy travels! No matter if you’re in Ireland, packing your backs or just thinking about visiting Ireland. Have FUN!